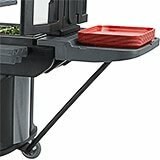 Convert the end of your Cambro food bar to an active service area. The optional end table easily mounts on either end. Designed to handle extra service, menu items or area to hold plates or trays. 27" x 22" x 4-1/2"
To be used with Versa Food Bars and Work Tables.